Beppu Hot Springs, originally uploaded by BlueBeyond. 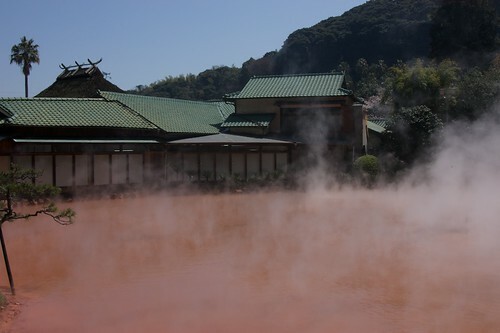 The wonderful city of Beppu on Japan’s southern main island of Kyushu is home to a wierd and wonderful assortment of hot springs and bath houses. Located right on the sea, Beppu is a terrific place to enjoy a relaxed Japan, with spectacular countryside and a wide variety of springs and mud baths. Located in quite a temperate, even sub tropical, climate, its strange to see the steam coming off the baths.